In conjunction with the 2010 Fulcrum Coaching and JBV Coaching Cyclocross Clinic that takes place this Saturday, top U.S. cyclocrosser, Jeremy Powers, will be answering your questions at the Bike Doctor of Waldorf during a Friday night meet and greet. This free event, made possible by the Bike Doctor, Cannondale Bicycles and Swiftwick, is open to the public. If you live in the DC metro region, take advantage of this opportunity. 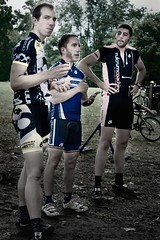 Jeremy is here to share his knowledge on all things cyclocross. If you are new to the sport or a seasoned veteran this is a great opportunity to pick the brain of a rider at the top of his game. The meet and greet is scheduled to start at 7:00 p.m.
As if you needed another reason to attend this event, Cannondale is upping the ante by giving away a brand new Cannondale cyclocross frame. The only catch is you have to be at the Bike Doctor Friday Night to win. Jeremy Powers is a professional cyclist with the Cannondale-CycloCrossWorld.com professional cyclocross team and the Jelly Belly professional road team. Last season he raced his way to 20 UCI cyclocross podiums and was ranked number one for the USA Cycling Cyclocross national racing calendar. In addition to racing domestically Jeremy has spent the last six seasons training and racing in Europe. He has represented the U.S. at the cyclocross world championships seven times. Along with Jeremy, Dan Tille (Fulcrum Coaching) and Chris Mayhew (JBV Coaching) will be on hand to field any training, nutrition and technique questions you may have. Tille and Mayhew are experienced coaches and seasoned racers with the knowledge to set you straight on a plethora of cycling-related issues. For those also attending the clinic, this is a great time to get your questions answered, leave that much more time on Saturday for hands-on instruction. For directions to the Friday Meet and Greet with Jeremy Powers you can enter into Google or MapQuest: 3200 Leonardtown Road, Waldorf, MD 20601. As an appetizer to the Friday night gig, we caught up with Jeremy to ask him a couple question about transitioning from road to ‘cross and his goals for the upcoming season. Have you changed your approach over the years in how you transition from road to ‘cross? Yes and no. Every year’s approach to the season is different because my schedule with Jelly Belly constantly changes from year to year in August and September. For example, this year I’m not racing the tour of Missouri because it was canceled. That gave me the opportunity to relax a little bit in July andAugust, and come into the season more relaxed. In turn, this will keep me more on task for doing well in December through February. In years past I’ve come out of the blocks with great form, fresh off Missouri and as the season and miles in the air add up, my form slips little by little as we make our way to February. So this little shift in timing and schedule is a huge change for me this year. It’s a positive change and I’m constantly trying to figure out the formula to racing competitively here in the U.S. all season and still racing at 100 percent in Europe in January and February. How have your ‘cross goals evolved over the years and how does this affect where and when you race? Back in the day … I definitely did whatever races could to garner a sponsor’s attention to my results! When I came back to the U.S. from racing in Europe in 2006, my number one goal was to find a good sponsor. I cherry-picked some races I could win and that worked out for me. A couple years later, with the help of Cannondale and Cyclocrossworld.com, I’m trying harder and harder to bring my best form to the biggest races of the season! Vegas, Ohio, USGP, Nationals, Europe, Worlds. I think once you get towards the top of any sport, you have to think about goals and what your weaknesses are so you can be the best you and get the most out of yourself. I set a lot of personal goals, some that aren’t even related to racing, like drinking more water throughout the day or getting in bed at 10pm! Looking at the scheduling stuff, the team and I try to build my schedule around what makes the most sense logistically and for our sponsors. There’s a lot of racing out there. Sometimes a weekend on the east coast with some racing is a nice break from being away from home and living out of a bag. Thanks for reading and see you on Friday.